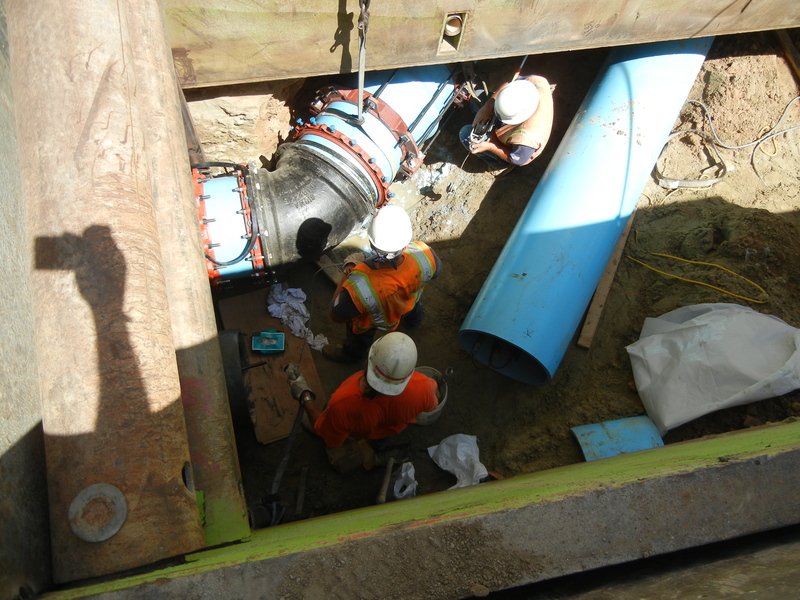 The installation of the new chilled water pipes along the northwest portion of the construction site is nearly complete. Plumbers from University Mechanical are here today working to complete the final tie-ins to the existing chilled water pipes. Nearly 100 feet of new piping has been laid. Thrust blocks are scheduled to go in tomorrow. These cement blocks protect the pipes from shifting and breaking as 4,000 gallons of water shoot through per minute. Testing is then scheduled for Thursday, and if all goes well, backfill will begin Friday. The big pile of dirt along the west side of the site, coined “Mount Aztec” by Project Manager Jamie Frye, will be used for the backfill. The construction crew and SDSU physical plant folks have worked hard to make sure pedestrian access from Aztec Green to Centennial Mall remains open throughout this underground project. Not only that, once the work is completed, the construction crew will widen about five feet the path of travel along the south side of Manchester. And if you’re still wondering what chilled water pipes actually do, they transport cool water to buildings for air conditioning. The piping connects the chiller to cooling coils in air handling units, where air is cooled and distributed throughout the building using ducting systems.